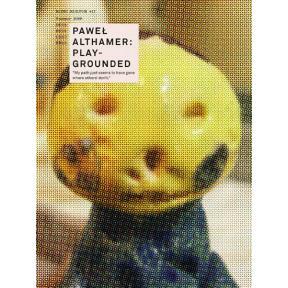 mono.kultur #17 is dedicated to the eccentric Polish artist Paweł Althamer, one of the most exciting and important minds among a flurry of contemporary Eastern European artists. Evolving from sculpture to more concept-based interventions, Althamer is famous for his unusual and often ironic way of approaching art. Be it by inviting art students to generate the content for his solo exhibition at the Centre Pompidou or by creating a path leading literally nowhere for sculpture projects muenster 07, Paweł Althamer always succeeds in disappointing your expectations and confounding art and reality. With mono.kultur, Paweł Althamer talked about the relationship between art and life, what we can learn from children and why it’s ok for art to take us nowhere. The issue has a grand Eastern feel to it, featuring some low-standard design as well as exclusive sights behind the scenes of Althamer’s notorious ceramics workshops, yes indeed.